click: Draw 1 card from the bottom of your stack. The grass looked greener on the other side of the tear. But it always did, and there was always another tear. Ah, yes. Window. One of the few cards in the game that seems to be utterly and completely useless. I'm going to play devil's advocate here, and try to find a use for it. What cards let you know the card on top of your stack? Motivation, obviously. If had just Test Run a program, then you know that it's sitting on your stack waiting. If you were just hit with Hellion Alpha Test or Sherlock 1.0, then you know what's sitting on top of your stack. If you get hit with a Data Hound, then you don't know your next draw...but you can be pretty sure that the corp wouldn't give you what you really need, so maybe the bottom is better. If you know the top card, why wouldn't you want to draw it? Maybe you're running an event economy build, and you need to find your Sure Gambles before you can afford to play the program that was just Test Run or Sherlock'd. Maybe you really are looking for that Account Siphon and Motivation tells you that the top card isn't one. But I think the most likely use is that you Test Run a Torch to the top of your deck, and then draw from the bottom until you find Eureka! to drop it for free. On the flip side, what lets you know the bottom card of your deck? 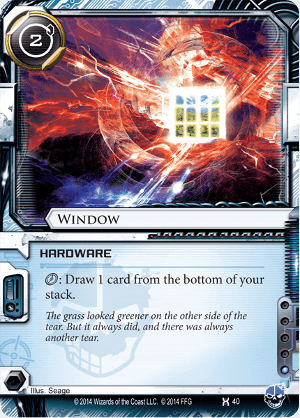 Mr. Li only gives you half of your cards; Window lets you take back the other half. Will-o'-the-Wisp is much less painful when you can just draw your breaker back again. This card isn't completely useless in every situation...only most situations, and requires some extremely specific support to be of any use whatsoever. It's worth playing, but only for the confusion on the other player's face while they try to figure out why you are running this waste of cardboard.